Living in country where Chinese culture had a very strong rooted influence, no one I think had never considered buying a lucky charm, although some say ‘luck’ is never real occurrence since everything that happen in a person’s life is brought about by his/her own circumstances.. whatever it is … I bought mine on weekend who knows I’ll be lucky this year. I was born in the year of the Rat …. I’m a goddam rat! So I wonder what’s gonna be a rat’s future in the year of the bunnies. An opportunist with an eye for a bargain, Rats tend to collect and hoard, but are unwilling to pay too much for anything. They are devoted to their families, particularly their children. Quick-witted and passionate, they are capable of deep emotions despite their cool exteriors. Their nervous energy and ambition may lead them to attempt more tasks than they are able to complete successfully. Rats are blessed with one of the best intellects going. The sign of the Rat is the first one in the cycle giving Rat people exude great leadership qualities and are good at taking the lead. They don't mind a lot of responsibility and they demonstrate a strong presence that other people respect. For those with the Rat nature, status and monetary satisfaction are the greatest motivation. The affect of the sign of the Rat is energetic, and demonstrates enough endurance to fight most any sickness. Yet, all Rats tend to be tense, full of nervous energy, and prone to stress. Yoga and meditation would benefit Rats by calming their aggressive natures and helping them manage stress. Rats make good homemakers who are always willing to do household chores. Because this is a sign of acquisition, the Rat person's house is presumably bursting with various knick-knacks collected over the years. Most Rats are cheerful, domesticated individuals who find happiness at home with their family. The Chinese say others should always listen to the advice of the Rat. Because of their intellect and observatory powers, Rat people possess prudence and perception. They can anticipate problems, and are always able to see the big picture. Status, money, title and recognition are important to the Rat. They have keen sense of observation that allow them to foresee upcoming business opportunities as well as potential occupational problems. The Rat makes a better boss than an employee. Rats work better in flexible situations where they can be freely creative. Cunning and thrifty, Rats have a knack with money and are apt to save for rainy days. When capable, the Rat is a great money saver, and in strapped times he knows how to make something out of nothing or how to make things advantageous for himself. 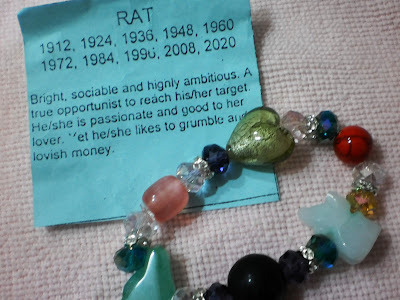 Generally friendly and sociable, the Rat is one of the extroverts of the 12 Animal signs. They have a special gift for easing the minds of others. It is not surprising that Rats have a lot of friends. To the people they love, Rats can be amazingly charitable, popular and supportive. Although Rats like to be in the driver's seat, they do need partners who can keep up with their active lifestyles. Rat people are romantic, and are always happier to have someone to share with. Hmm, I never have considered my birth year to influence who I am. I trust in God. I'm with Sally, I've never put any trust in horoscopes. My trust is in the Lord. Happy Blue Monday to you, Venz. I also just look at them for fun, not necessarily do I believe in them. Your bracelet is cute. Happy Blue Monday! Heheheheh si John nANINiwala dyan ako hindi lol. Pretty! Musical Snow Globe, is my entry. Have a great week ahead! i don't, hehe. agree with sally...faith and destiny...one or any fengshui cant change it. er, i think it's a nice bracelet. wished it could charm ur way to more blessings. A very interesting and different blue feature for today. I learned something new every day on the blog. That bracelet is really pretty! Hi Vernz did you follow the old zodiac sign or the new one. I choose to remain my old sign which is Aries/horse than become a Pisces I even don't know what is a Pisces lol ^_^ Happy blue monday! walay kaluha ana te? hehehe...I love bracelets...labi na burloloy parehas sa ato...kana daghan charms...eehhee! glad to know about your sign...ako kay monkey man ko...ehehhe! That is so pretty. Akong anak hilig ug ingon ana. Nagpalit na sad gani siya ug mood ring daw..hehehe..
yay, ang Rat ug Bunny nag uban adtong Sunday hahahaha...naka post na jud ko Vernz, tua sa Mom's place.